In the newest BIG BROTHER 14 commercial we meet each of the 12 new house guests before the July 12th premiere, in addition to hearing from the host Julie Chen, executive producer Alison Grodner and Rich Meehan. They discuss this seasons cast and the Big Brother Mentor Twist that has never been seen before. CBS has shown the mentors behind a towel in a recent promotional photo shoot. Now with this new video we see the Mentors hands holding up 4 cards with Guess who, Surprise, Beware , and The Unexpected written in them. There is a lot of rumors rolling around about who the Mentors are with most signals pointing to Boogie, Janelle, Britney Haynes and Dan Gheesling. Still it is unknown how these twists will play out and to what capacity will the mentors play the game. Tune into the premiere episode on Thrusday when the 4 returning house guests identities are revealed. Sign up for the Live Feeds before July 11th 10pm and save 25% on your live feeds, Mobile option comes free with a live feed superscription. Big Brother 14 CAST PHOTO Released With Alumni Mentors! CBS has released the Big Brother 14 Cast photo of all the house guests in the backyard of the Big Brother house. Its nice to see Wil Heuser isn’t afraid to rock the banana hammock. The photo also includes the Big Brother 14 Alumni Mentors hidden behind a towel. From the looks of it, it looks like Britney Haynes legs second from the left and Janelle Pierzina four from the left. Its too hard to tell for sure which male mentors are coming back from the photo, but its a strong possibility that its Dan Gheesling and Mike “Boogie” Malin. If you don’t already have the Big Brother Live Feeds, NOW is the time to SIGN-UP! Every season before the première SuperPass offers the Early Bird Special where you can save $10 off the regular 3 month subscription price. That allows you to watch the ENTIRE season of Big Brother 14 for only $29.99! Plus you get $30 in music credits, exclusive interviews, and much much more ..so its win win! Just days before the première of Big Brother 14, CBS has release another video interview of each of the new Big Brother 2012 cast. 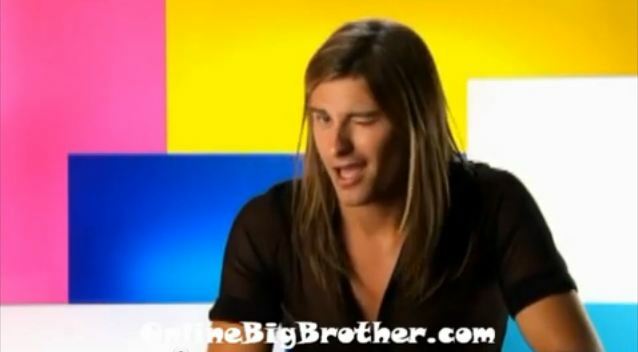 In the video interviews each of the new Big Brother 14 House guests talk about their strategies for winning BB14 and also answer a few other questions about themselves and who their favourite Big Brother Alumni are from past seasons. We’ve read the new cast bios, Seen the Big Brother 14 House, and we’ve heard about the mentor twist were 4 “successful” house guests will be returning to the game. In a Series First, Four of the Most Successful Players of All-Time Return to BIG BROTHER, Playing the Game with Their Own Agenda and For Their Own Prize. While we dig up more info (Here, Here and Here) about the Cast and wait for more Twist leaks to come CBS has released a series of images from a recent photoshoot of the BB14 Cast. don’t forget to like our onlinebigbrother facebook page. remember Onlinebigbrother gets a percentage of ever live feed we sell so if you hate us do not buy the live feeds from us. This offer ends next week before the day of the premiere . CBS has finally released the full cast Bios of the NEW house guests for Big Brother 14! Below are the house guest bios of the new cast which includes a short description about themselves and their answers to a few questions to get to know them better. The video interviews of the new cast members have also been released and are available on SuperPass. To watch all of the cast videos simply sign into your Superpass Account and click Big Brother 14 under the Big Brother menu. It looks like we have a pretty diverse cast this season with some interesting characters. To get the full impression of the new cast you really need to watch their SuperPass Interviews. If you haven’t already signed up for the SuperPass Big Brother Live Feeds, NOW is the time to do it as you can save $10 off the regular price. From now until July 12th SuperPass is running their regular per-season Early Bird Discount, where you can watch the ENTIRE season of Big Brother 14 for ONLY $29.99! That’s only $10 per month, plus you can also enjoy a lot of other bonuses like a $10 Music CREDIT per month. This is a limited time offer that will expire before the première, so dont miss out!